Which northern Ontario town had its own street cars, was home to the guy who wrote the Hardy Boys, had the most millionaires in Canada, was the first home of the team that would become the Montréal Canadiens, and then promptly had its prosperity wiped out by a massive fire? Back off St. Clair Avenue West…Haileybury has had streetcars too! The thing that makes Haileybury really northern is its history. The rise and fall and apparent rebuilding is really interesting and, in my opinion, totally characteristic of northern Ontario. After Longlac and Opasatika, let me guess this is a lumber boat? Once known as Humphrey’s Depot, Haileybury was founded in the early 1900s by a former fur trader on the shores of Lake Temiskaming. He named the town after the school he attended in England. He tried to attract settlers with the usual propaganda leaflets, but as northern Ontarians know, there’s no better way to get the country settled than a gold rush. And that’s what it took to get Haileybury off the ground. Despite being named after a place in England where wealthy parents got rid of their kids, Haileybury is the start of francophone north-eastern/central Ontario. (Or it is the end, depending on which way you’re traveling on Highway 11.) Approximately 80 percent of Haileyburians are French-first, which is interesting given that their neighbours are primarily anglophone, particularly in New Liskeard (70 percent) and Cobalt (almost completely unilingual.) As you go north after Haileybury, the towns almost alternate – anglo, franco, etc. The discovery of silver in Cobalt in 1903 started a population explosion in Haileybury, as the town became a bedroom community for prospectors and mine owners. So successful were some that a street in Haileybury was dubbed Millionaire’s Row for the wealthy people it housed. But of course, this all had to come to a tragic end with the fires of 1922, which killed 11, displaced 3500, and razed the town completely alongside New Liskeard, Dymond, and possibly Cobalt. In order to survive, many families had to hide in wells, lakes, and even down mine shafts. Many of those who escaped to the mines died when the fires, passing over the mines, sucked out the shaft’s oxygen, asphyxiating those who sought refuge underground. 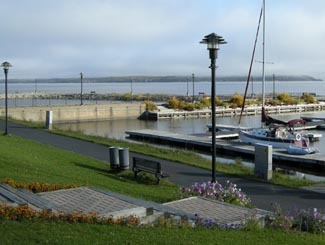 The town commorates the fire with a sculpture at its waterfront park, pictured below on the left. With 4500 people, Haileybury (pronounced locally as Hailey-berry) is the second largest part of the Tri-Towns and Haileybury is the seat of the Temiskaming Shores municipality, which includes New Liskeard and Dymond. It is a quiet lakeshore community that is worth a stop if you’re not in a hurry. I really like the waterfront. There is a nice little pavilion with the Pioneer’s Monument (pictured) honouring the fire of 1922. There is a little beach and a modern marina as well. The view is nice across the lake to Quebec and in the summer you’ll see a number of boats on the water as Lake Temiskaming is the end of the scenic Ottawa River route, which is popular with boaters. The waterfront is worth a drive, if not a full stop. In terms of tourism, there is a fair amount to do. The Haileybury Heritage Museum was built to chronicle the history of the town and tell the story of the fire. 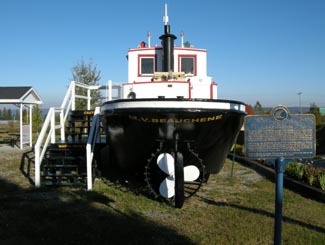 The museum features a restored 1920s streetcar, as well as an old firepumper and a preserved tugboat that used to ply the waters of Lake Temiskaming. You can also visit the “world famous” Haileybury School of Mines. Haileybury is also home to the Temiskaming Art Gallery. You can see different types of ores at the Rock Park Walk, while there is camping and golf in town as well. I don’t remember a lot of places to eat, and I think the only Tri-Town Tim Horton’s are in New Liskeard and Dymond. Accommodations include the Leisure Inn, Edgewater Motel and Cabins, the Haileybury Beach Motel, and the Les Suites des Presidents Suites, an upscale bed and breakfast. New Liskeard has more places to stay and eat. Personally I find that Haileybury, despite being very pretty and having stuff to do, is still something of a bedroom community. It doesn’t have the same downtown nor the same ‘feel’ that New Liskeard does. And it’s nothing like Cobalt. At all. Haileybury was also home to the team that would become the Montreal Canadiens. The club played the 1909 NHA season and left for Montreal. It would become the Canadiens only two years later. I think that’s pretty neat. Haileybury’s streetcars were part of the Nipissing Central Railway that connected the Tri Towns, which would definitely make it unique in the north. Heck I’m sure it ran faster then than Timmins transit does today. Toronto also donated 87 streetcars after the great fire to help shelter the homeless. Today there is one restored streetcar left at the Haileybury Heritage Museum. And, to finish, Haileybury was also home to Les Macfarlane, who wrote many of the Hardy Boys novels under the pen name Franklin Dixon. Thanks to Johnny O for the info on the Tri Towns. I never liked the Hardy Boys. Too All-American. Too serious. Too predictable. Sure, you knew that Encyclopedia Brown was always going to figure it out too but at least he had a sense of humour. But, anyway, this is a replica of the Hardy Boys’s boat, in Haileybury. This entry was posted in Temiskaming and tagged amenities, boating, francophone, great fires, hockey, mining, railway, streetcars, waterfront by Highway11.ca Editor. Bookmark the permalink. My father, Bill Hogan was born in Haileybury in 1918. His family was burned out during the fire. I believe that is when the Hogans moved to Kirkland Lake. Very interesting reading on this site. We were born and raised in Kirkland but always loved the tri-towns. Meet at the Park on the Corner of Georgina Av & Amwell St. (Across from the Court House) by Cenotaph at *2:30 pm. The route will take us by the Court House, Post Office, Banks, Legion & Local Beaches & Hotels. It’s about 20 25 min. to walk, at a slow pace, ending in front of Temiskaming Shores City Hall. We are currently Working on our SECOND Annual 420 Event for 2016!! Well although I am NOT from Haileybury, but Kirkland Lake.Iit has been a real treat to learn so much from this article. My experiences were from playing hockey against the 54s and Cubs for so many years. Certainly this town was rich with players all the years we toiled. names I remember now are Paiment, of course, Heard, Hearn, Little….and many more. Always remember the the rink….up high from the road….the ice shape was like an egg (corners that went on forever) and mesh for glass. Many tough games played on that ice. We are all so proud to be from the north…..with a far richer history than most would suspect. I am from New Liskeard and just a tip, most people from the region pronounce Haileybury “Hell-burr-eh” or “Hail-burr-eh”. down in Cobalt.I have a lot of familly history there.My grandfather Leo Deraiche had a trucking company.I remember the Cobalt fire. please join the “official” facebook group of Temiskaming Shores, not a buy/sell group, I repeat: NOT A BUY/SELL GROUP. 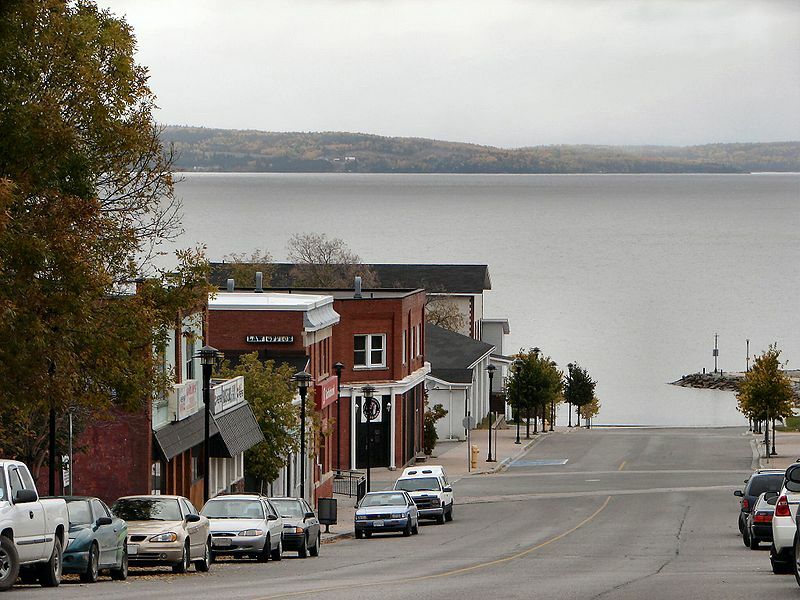 I grew up in Haileybury and visit each summer when heading back up to the cottage. The town was’t completely destroyed in the 1922 fire as stated in the blog. I grew up in a century home that was built in 1908 by the area’s first MP. I was born in Haileybury in 1957 my great grandfather is A.J. Murphy, grandfather Russ murphy. They owned A.J. Murphy Lumber Co. My father is Jack Murphy his brother Jim owned White Pine Lodge. Mom and dad spent 30+ years in Nfld. Dad flew helicopters hear , then was airport manager in Churchill falls in Labrador Nfld. They retirerd in Harley township until my father past away. Now my mother is living in her home town of New Liskeard. Her name is Irradelle Murphy (Taylor). Wow..I Sandra Belanger (née quehe) was born in nfld (corner brook) in the sixties and moved to haileybury/new liskeard area in late sixties…. My grandmother is Eva quehe also born in corner brook! My mother, Rita Huard, was born in Haileybury in 1917. My grandparents owned a farm on the old North Rd. My aunt Omerine at the age of Steven yrs old was a student at the convent and had to jump in Lake Temiskaming. My dad, Philippe Ayotte, was from New Liskeard. Both my grandparents were dairy farmers and stood on street corners in order to give milk following the fire of 1922. My parents were married at Église Ste Croix in 1940. I recently bought a house on Probyn st. We found out that it was built in 1915 before the fire and with-stood the fire. I would be interested in learning any history on 391 Probyn st. I think I coached hockey with Dan. My name is Brad Adams. Dan May have helped out when I played hockey as a kid? Merv,at Mr.Huard next to the fire hall,good memories.Lived in Haileybury, again in 1956. I grew up down the street from the Lavigne’s. My dad worked with Merv at HSM, and I remember attending my first political event at their house when Kathleen brought in Pierre Belanger as the Liberal candidate. There were a few teenage girls hooked on politics after meeting him. Danny was always very friendly and always had lots of questions to ask. I think he and my dad joined a few other men for lunch each Monday until my dad moved south. I lived in Haileybury from 1964 to 1972, and love the place. My father taught at the HSM. I remember the Lavignes and the big house on Brewster. I think it was pink, lol. Danny knew more about hockey than anyone. He could recite statistics about any player in the 12 team league. I remember the lavignes well as a kid we lived on the corner of Probyn and georgina ave, not from from the lavigne’s Brewster street home, just up the hill, hung out with John, Danny and sometimes Anne here and there, when I was a kid there in the early 60′s….. our family and I moved out west but came back in 73, Saw them again once in a while, then. I still run into Dan when I go “home” and he always remembers my name, he’s a lot better than I at remembering names of people I rarely see.. I am Bob’s son, Matthew, the grandson of Merv and Kathleen. I spent many summer in their pink stucco home on Brewster. I have fond memories of playing hide and seek with my 4 siblings, all Anne’s children, in the nooks and crannies of that old house, especially in the rustic basement. I am very eager to learn more about my grandparents as I grow older. I am saddened to report that Merv and Kathleen have passed within the last 2 years, however, their memory strongly lives on through tales of their love and faith. burned to the ground.Does anyone remember the year exactly? My great uncle, (my great grandfather’s brother) was Horace Gaul. Horace was born in Gaspe in 1883. He played for the Haileybury Comets in the 1910 season. He also won 2 Stanley Cup’s playing for The Ottawa Silver Seven in the 1904-05 season and again with Ottawa in the 1911 season. He finished his professional hockey career after the 1912-13 season with the Toronto Tecumseh’s. Any information about him or the Gaul family would be greatly appreciated. Thank you. My Grandparents, Maude and Richard MacGregor are buried in the Catholic Cemetery along with some of their children. They were also in the Great Fire of 1922. My Grandfather took people in his car to safety to Cobalt. My Mother Kathleen told me many stories about life in Haileybury and the fire that took the town. My Grandfather was affiliated with the Attorney Hotel at the time. Along with everyone else they lost everything they had but were always grateful that they all survived. We visit Haileybury on our way to Kirkland Lake for holidays. Haileybury is a beautiful place. My birth grandmother was born in Haileybury in 1921. Her name is Pearl Luella Harris. Her father was L.H. Harris and her mother was Jessie Harris. She had 2 brothers…Allan and Martin W. Harris and a sister Francis E. Harris. She was the youngest of the 4 children. Does anybody know if her family stayed in the area? So many changes between Latchford and New Liskeard. It’s nice to see so many with an interest in our home towns. It’s such a long drive to visit with family and it isn’t often – but definitely enjoyed once there. You just can’t beat the scenery and hospitality – the north is second to none. I was born here in the Haileybury Hospital, loved where I grew up spent many days in summer at the beach, once it was closed in swimming lessons were much easier. Lake Temiskaming got pretty intense as it is a big long deep lake. Went to ECCS and NLSS High school which changed its name from NLSS to TDSS in my last year. Met and still have a tonne of friends I went to school with. It was a fantastic place to grow up! Did you mean ESSM? Are you the Julie Sauve who would have gone there in the early 80′s? I went to ESSM, under my maiden name Jennifer Godfrey. HI JENNIFER. I AM FRIENDS WITH JULIE SAUVE. I’m back not been on here for a long time, yes it’s Julie Sauvé, I don’t speak much French, would love to but now at 45 with MS no husband or kids which I wish I had but marriage needed and I would adopt an older child. I was born in the Haileybury Hospital I went to Haileybury Public School and then at some point they re vamped the hospital which stood abandoned for so long… Into apartments. My grandma moved into one and I thought that was pretty cool! There’s no place like home I’m related to the Bourtons, Shavers and Kennedys! I grew up in Latchford, playing tag with friends & family around gas pumps. lol! Attended St. Pat’s in Cobalt for a brief period, until ECCS was finished, then NLSS. During my high school years I shopped in downtown New Liskeard, (no mall then) and socialized mostly in Cobalt. But a highlight of my memories of Haileybury, was the Arena where dances, hockey games, and time to time wrestling matches were held. The best one featured Andre` The Giant, during his climb to fame in the WWF/WWE. Born and raised in Haileybury, went to Haileybury public school then to NLSS. Played a ton of hockey in the three rinks, (Haileybury, Cobalt & New Liskeard)….I certainly remember the wrestling match with Andre` The Giant. After school I worked at Agnico Eagle mines in Cobalt until it shut down then moved to Timmins to continue mining. Now retired and living in North Bay, our family home was at the bottom of Elliot Street overlooking beautiful Lake Temiskaming….really miss that view looking up the lake towards New Liskeard, especially when a big thunder/lightning storm would follow the lake, very impressive light shows on many occasions. Good memories. I grew up making french fries with my grandfather for his chip stand at the beach. Sanche was the last name. Great times. Will never forget Haileybury as I grew up there along with the Murphy family, Kingsmills, Bonds, Dorans, Gardiners, Pelangios,Whitbys. and many others. As a matter of fact my three siblings, Charlie, Lynda and Jani have all migrated back to the town and enjoy all it has to offer both summer and winter. They were very formative years with the figure skating club, golf club, ski club and water front ( a lot different back then) . Never a dull moment with the rivilary between the three towns with football each Fall. Although I travel back each summer there are very few familiar faces and even with the upgrades to much of the town it seems reluctant to progress. I feel the area has so much to offer and some how just needs some folks to give it a push and use some imagination to deveope all the natural resources there. I love the summers but living a bit more south my blood seems to have thinned and the winters are just way too cold and way too much snow. it will always be a special place in my heart, and I will continue to return. We use to live in the Whitby’s old house. 600 Georgina St. Even though I was young, and we only lived there for about 5 years, I loved our time in Haileybury. I just bought the “old Whitby house”, as people still call it. Moved to Haileybury from Toronto. Love the area and the house. Hi, we used to live at 550 georgina, corner of probyn and georgina ave, my father had that house built in 57-8 , if my memory is correct the “whitby” place was at the”end” of georgina ave with a large ‘turn around” type of driveway , in those days the trees down that end of that street grew up and over making a shady covered part in the summer. I believe the whitby family ran a pharmacy downtown in the place where the “kingsway restaurant is now and has been since it opened in the late 60′s we played a lot along that street calling it the “dead-end” back then, only a dirt road connection to the lakeshore road at its end. actually the house just next to it on the uphill side might have been the whitby place as well, different sibling or generation whitby. but then again my memory of the early 60′s can be a bit sketchy at times still very good memories. What a great place to raise a family.. we did and proud of it! Everytime I drive down the courthouse hill just can’t help beeing gratefull for the beautiful scenery. Did you ever see the lake glissening early sunny day? Absolutely breath taking. The National Hockey Association of Canada was a professional hockey league that was founded on December 2, 1909. The league was formed in response to the formation of a league called the Canadian Hockey Association [CHA], a league that was primarily formed to exclude the Montreal Wanderers from playing with the other teams that had made up the Eastern Canada Hockey Association in 1908-09. The founding franchises were the Montreal Wanderers, Renfrew Creamery Kings, Cobalt Silver Kings, and Haileybury Comets. A second team from Montreal was admitted to the league to spark interest among French-speaking fans: Les Canadiens. The schedules for both the NHA and the CHA started on December 30, 1909. The competition between the leagues for fans was taking its toll on both leagues. With five teams in Montreal alone, there was simply not enough public support. Discussions ensued to merge the CHA and the NHA, however when the dust settled, on January 15 1910, the CHA had been dissolved and two CHA teams, Ottawa and the Montreal Shamrocks, were admitted to the NHA. All games played prior to January 15 were removed from thestandings. The NHA’s second season saw the withdrawal of the Montreal Shamrocks and the Haileybury and Cobalt clubs and the addition of the Quebec Bulldogs. Renfrew dropped out the following year leaving just four teams competing in 1911-12. The NHA admitted two Toronto teams, the Torontos and the Toronto Tecumsehs, for the 1912-13 season, bringing the league up to six teams. World War I had a significant impact on the NHA, as its players enlisted in the military. As a result of the shortage of players, the Toronto Shamrocks dropped from the league in 1915-16. A new Toronto-based team was formed for the 1916-17 season, made up of players who had enlisted in the armed forces. The team was named the 228th Battalion. This team was forced to withdraw from the league when it was sent overseas for active duty. To balance the schedule, the league ordered the second Torontoteam (the Torontos) dissolved and their players distributed among the other clubs. This action set about a course of events that would lead to the formation of the National Hockey League. The owner of the Torontos, Eddie Livingstone, was displeased with his treatment and sued the NHA. The other NHA owners were fed up with Livingstone and wanted no part of him. In November 1917, the NHL was formed as the four former NHA members – the Montreal Canadiens, Montreal Wanderers, Ottawa Senators, and Quebec Bulldogs (who later withdrew and were replaced by the Toronto Arenas) – without Livingstone, voted to form the new league. I am trying to find out any relevant information on Lambert Gallop, from the early part of 1900. His folks moved to Saskatchewan in 1910 and he stayed behind. Is there a grave marking for him? Did he have a claim to fame? Any information will be greatly appreciated! Thanks! My grandfather, Gervais Sutherland, was a volunteer fireman during the Haileybury fire and lost his life then. He left a wife, Eva Sutherland, and three children, Ted Sutherland, Norm Sutherland, and my mother Muriel Sutherland Hennessy. My family attended the 100th anniversary of the Haileybury Fire Dept. and were very pleased when a street was named in Haileybury after my grandfather. Just curious if Gervais Sutherland was related to to Mable Sutherland, my grandmother, who became a Grozelle. My dad always told me he had an uncle who died in the Great Fire. @Kathryn Shasha- Yes, Gervase Sutherland and Mabel Sutherland were brother and sister. It seems to me that Mabel married Percy Grozelle. She was my mother’s aunt. My mom’s name was Muriel Sutherland Hennessy and she passed away in 1965. I lived in Haileybury as a boy in the late fortys to 1958. We lived on the corner of Probyn st. and Lakeshore rd. My Grandfather had it built after the the original one was lost in the fire. It was a large house with a sun room on top. Lemon, and he ran the pump house at the bottom of Browning St.
Stan: I lived at the corner of Browning and Ferguson Ave from 1922 to about 1940. Upstairs in an apartment with north windows and east windows so I could see both the Lemon house and the pump house. I remember the Lemon house very well. A great veranda. Across the street was the McCauley house and at the corner of Probyn and Lake Shore was Mrs Stitt. Johnny Bell in between..
As for your grandfather, I guess I knew him as he was the man from the pump house that drove the town steam roller and sometimes he would let me stand beside him. I would see him starting it up with the fire in the boiler and I would go to watch. I suppose I was about 8 years old. It was kind of him to do that. The house was still there about five years ago. My parents lived in Hailebury during the great fire. My grandmother was alone in their house with two “wee” babies-my mother and his sister. My grandmother buried some valuables, but they were stolen. She found a farmer with a wagon on the road who took her and my mom and aunt with him-but my mom ran away. In fact, she ran and hide in a house that did not burn down! All my life I have heard stories about the fire. My grandparents continued to live in Hailebury and went on the have three more children. My grandfather died in 1944, but my grandmother soldier on until 1984. I always enjoy visiting Hailebury when I was a child, and I hope to go back there next summer. Little correction…the Montreal Canadiens was formed by the towns Haileybury and Cobalt. This is where the CH logo came from. Wow…dod not know that thanks! Umm, no. The Montreal Canadiens was a completely separate team from Cobalt and Hailebury. I don’t feel like getting into a long and winded post, so I’ll keep it brief. When the NHA was being formed the owner of the Cobalt and Hailebury hockey teams, John Ambrose O’Brien was approached to make a 3rd hockey team in Montreal, to compete with the Wanderers. This team was to be an all Francophone team, owned by Francophones. To appeal to the Francophone population in Quebec. Now obviously John Ambrose O’Brien was francophone, so part of the agreement that was made with him was that he would transfer ownership to a Francophone, ASAP. That francophone eventually turned out to be George W. Kendall (Kennedy), owner of the Club Athlétique Canadien (CAC). The Montreal Canadiens were simply known as Les Canadiens back then. They played both Hailebury and Cobalt in the NHA in the first year. In fact, their first win of the season came against Hailebury. Hailebury and Cobalt both folded after 1 season in the NHA. My husband Terry and I from Mountain, On as well as two other friends from Godrich, On feel led to come to Haileybury next long weekend in August. It’s a first for myself and Terry. Anticipating a time of discovery and revelation. Looking forward meeting the locals and learn of their town and heritage. We have no set plan for lodging or… Perhaps bring a tent for back up. We love the spontaneous, to see how God unravel things for good. i had a cousin that was married to broderick from breathor belle valley area there is still a few by that name around i am sure. I am doing the Rice family history and there is branch that we are looking for contact with. An Eugene PAYETTE and Mary Rice were married and moved to Haileybury. She died in approx 1906, leaving three small children. He then remarried in 1910 to a Marie Anne Richard. He was 36, listed as being a tailor. I am looking for any decendants of this family, especially the three from the first marriaage – we believe one of them was named Abigail. I grew up in Haileybury, but the names you’ve given don’t ring a bell. William Hercules Rice married to (Amelia Elizabeth Jamieson) came north to start clearing land in 1901. Amelia followed afterwards in 1903 with their two children Muriel and Foster to settle. Was Rice, Mary’s married name or family name? I was born in New Liskeard and spent my childhood equally between New Liskeard, Haileybury and Cobalt – I know a Corey Payette (almost 30 I believe, also grew up there and now lives in Vancouver …the Artistic Director or urbanink productions) – Maybe he’s related? 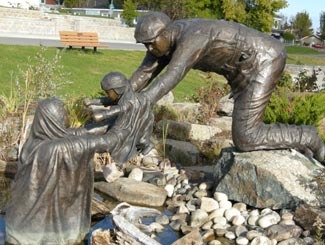 My Great-Grandparents lived in North Cobalt during the fire of 1922 and we were wondering if the staue of the Mother handling the baby over is of a fictitous person or based on a real situation and real people ? Fictitious characters, but based on the history that the fire of ’22 was so very hot that it literally melted the railway tracks and everything in it’s path. People, in order to survive went as far as they could out in the lake (Temiskaming). This statue by our wonderful Ernie Fauvelle of Haileybury shows someone assisting a woman by lifting her child out of the water to safety when things are all clear. Ernie had models to work from. I had to draw a diagram of the monument concept–which was later shaped in styrofoam by André Dupuis. People purchased memorial bricks to pay for this beautiful monument that is on the shoreline. I believe the poem inscribed on this statue was written by my brother Brian Beaudry. My grandfather Phillippe Barrette was one of the people that helped get people to the lake….He had his horses & wagon & was going along the streets picking up people & taking them to the lake…My father was only 3 months old & I was told that when it was safe to get out of the lake grandpa went back & got my grandma & father out…grandma handed grandpa the baby…I will always think that the statue was done in memory of them…My grandfather was a fireman ….